11/06/2012: Here's a link to a marvelous animation of the whole evolution of the storm, produced by Matt Shatley at the University of Delaware, and here's one to a NASA animation. Here is also an interesting comparison between the two hurricanes, Sandy and Katrina. The press has thrown out the idea that a "baroclinic enhancement" to Hurricane Sandy allowed it to develop renewed strength as it approached a Canadian cold front brought in by the jet stream, but I haven't seen that term "baroclinic" explained anywhere in simple terms. When I try to Google it, I get more equations than words,** so I'm going to try to explain it here. Take heed: I'm not a meteorologist, just trying to learn! Two "baro-" words occur commonly in meteorology. A "barotropic" atmosphere is one in which the density depends only on the pressure; these are typically in the tropics. (Note the word "tropic" in this term.) A typical barotropic region is the southeast U.S. in the summer, or the tropics, where everyday is about the same: hot and humid. There are no weather fronts in a barotropic atmosphere. A "baroclinic atmosphere" is one in which the density of the atmosphere depends on both the temperature and the pressure; these are typically in the midlatitudes. Baroclinic atmospheres have distinct air masses of different temperatures with boundaries (frontal boundaries) between the two. There are density gradients at any level of the atmosphere in baroclinic environments. One website suggested that you can remember the character of a baroclinic atmosphere by the word "clinic": the atmosphere is out of balance just like a person who feels out of balance would need to go to a "clinic." In fact, "baro" refers to surfaces of constant pressure, and "clinic" to surfaces of constant density. A flow is baroclinic if surfaces of constant density are turned at an angle with respect to surfaces of constant pressure, a point that I'll get back to toward the end. In the photo above, the cold front is marked by a blue line, Sandy by the red symbol, the subtropical jet stream by a green arrow (bottom center), and the blocking pattern by the "L" in the upper right. The subtropical jet stream is already deforming Sandy from the symmetrical shape expected of a classic hurricane into the "comma" shape typical of Northeasters. The trough in the polar jet stream lies behind (west) of the cold front. 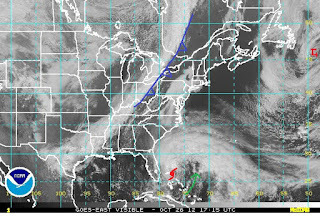 The blocking pattern keeps Sandy from escaping to the east. Although not obvious on surface level maps, or even on the 850 mb level map below, Sandy is sandwiched between the polar and subtropical jet streams. "There are two main types of temperature instabilities in the atmosphere: vertical and horizontal. The Frankenstorm draws energy from both of them. Vertical instability comes from the difference between the warm ocean waters of the gulf stream and the cooler, atmosphere above. Hurricanes draw their energy from the ocean and release it in their vertical convective updrafts, creating a “warm core” of latent energy release around the center (remember, warm air rises). This warm core is clearly apparent around Sandy in [the image to the left in this blog post], as the 850 mb temperatures are warmer around Sandy’s center than in the surrounding areas. The second type of instability, horizontal (or baroclinic) instability, is employed by mid-latitude, extratropical cyclones. 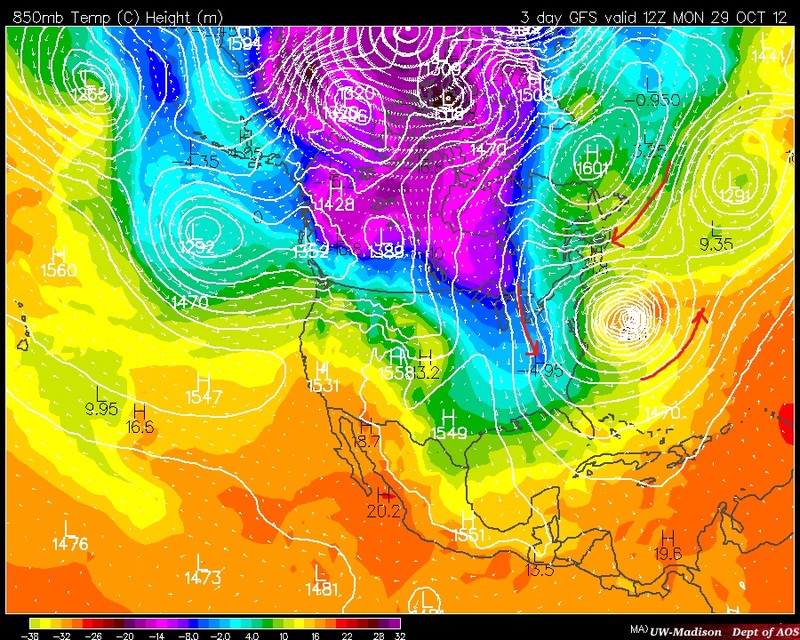 Sandy’s warm core is in sharp contrast to the colder 850 mb temperatures over the continent. The potential energy between the warm and cold air is released when the cyclone draws warm air northward (the red arrow to the east) and cold air southward (the red arrow to the west). This storm is a hybrid system because usually weather systems only derive energy from one source or the other. Both of these instabilities tend to be at their greatest in the autumn months, and both are being combined in this storm." The 850 mb map shown here (a few km above the surface) shows these strong horizontal temperature gradients, as well as (small white arrows) the wind speeds. 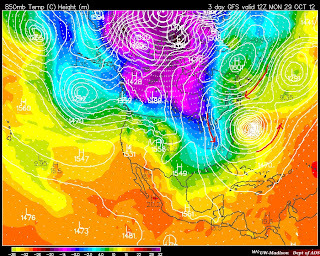 Colors are temperatures with yellows and reds being warm and blues and purples cold. In addition to the two red arrows mentioned above, the third one, farthest to the north, indicates where winds coming in from the northeast are very strong. These winds are "squeezing" between the two low pressure systems (in the yellow-green region) and the high pressure system (blue-green region) to the north. Now, to get back to the baroclinic instability between Sandy, which has a warm core, and the cold air being brought down from Canada by the jet stream. Think first about an idealized situation: a circular mass of cold air (corresponding roughly to the purple and blue above) surrounded by warm air. If the earth did not rotate, the cold air would tend to sink and spread out uniformly under the warm air. Because the earth rotates, however, Coriolis forces cause the spreading cold air to gain a component of motion parallel (azimuthally) to the circumference of the circular mass of cold air. That is, the Coriolis force is balancing the gravitational force and prevents the column of dense air from spreading infinitely far away. The circumferential wind around the edges of dense polar air masses is called a "thermal wind." If this wind is sufficiently dense, an instability develops in the wind, and large-scale eddies spin off of it and move toward lower latitudes. In so doing, they horizontally mix up the cold and warm air, and convert potential energy stored in the cold air into kinetic energy of the eddies. Another way*** to think of this is to imagine two columns of air that have the same pressure at sea level, a cold one with density r1 and a warm one with density r2, where r2 is less than r1. At any height in these two columns, the pressure in the warm column will be less than that in the cold column, destroying the hydrostatic balance between the two columns. Cold air would flow in under, and mix with, the adjacent hot air until the pressure balance is restored. A third way, through a PPT presentation that I found by Prof. Mathew Eastin of UNC Charlotte can be illustrated by the "coin physics" on the adjacent figure. Sitting on its edge, the coin is unstable with a center of gravity above the surface of the table. There is a potential energy in the coin that can be defined by the position of the center of gravity. A small disturbance will cause the coin to fall (potential energy being converted into kinetic energy) to a stable position with lower potential energy when it comes to rest. Note that the warm air has indeed gone northward, and the cold air southward as needed to reduce temperature gradients across the hemisphere. Now, look at a cross-section of a hypothetical, four-layer atmosphere from the equator to the pole. Uneven solar insolation causes the air at the poles to be denser than the air at the equator and so the layers of the atmosphere are tilted at an angle to the isobars, lines of constant pressure. (Note, in the top part of this figure that although pressure increases downward, isobars are not horizontal but would be tilted toward the upper left). Each layer has a center of mass, as does the whole system (red dot). Each layer, and the system, has some available potential energy. If the system is pushed by a small perturbation, just like the coin, it will move to a lower energy, more stable state with a lower center of gravity for the dense layers, and a higher center of gravity for the light layers. The center of gravity for the whole system, dominated by the dense layers, moves down, reducing the potential energy of the system. Another day of uneven solar insolation and the unstable situation is set up again. P.S. Returning to Will Komaromi's blog that I referred to in an earlier post, he points out a measure of storm strength called the Integrated Kinetic Energe (IKE), a measure that combines size of the wind field with the strength of the winds. 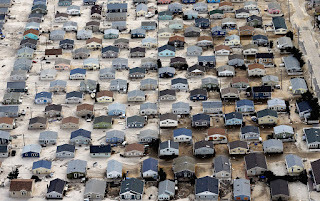 Sandy had the highest IKE of any tropical storm on record, with almost 4 times the IKE of Katrina. This measure, unlike the category classification, explicitly accounts for the immense size. ***The text at this link was written by Yochanan Kushir, 2000. Why did Sandy leave so much sand in Seaside Heights and even NYC? While this is a particular and immediate case study, sand movement is an issue at many coastal cities. For example, project SANDAG is a $28 million regional sand replenshment project in the San Diego area; the Army Corps of Engineers proposes to spend $251 million on sand projects for Encinitas, Solana Beach, and San Clemente. Beaches are both formed and destroyed by wave action in the normal (note that word "normal") course of geologic processes. Waves move sand particles either in suspension or by saltation--bouncing along the bottom. These particles come from the erosion of rocks offshore, or from the erosion of sediments along the coast. Sometimes the sediment is transported long distances--the white sand along Florida's "Emerald Coast" comes from the erosion of quartz in the Appalachian Mountains. Some waves, referred to as "constructive" waves move sand up onto a beach; "destructive waves" move it from the beach, forming a slopes that disappear some distance below the surf. Wind often moves the sand on beaches into dunes. Offshore, a common coastal landform is a barrier island, a long linear sandy island or series of islands that can extend over 100 km along a shoreline. Long Island is an island formed on glacial moraines, but has elements of barrier island geology where barrier islands of sand divide the lagoons south of it from the Atlantic. The true barrier islands are Coney Island, Long Beach Barrier Island, Jones Beach Island, Fire Island, and Westhampton Island. In New Jersey, the famous beach spots of Seaside Heights, Atlantic City and Wildwood are on barrier islands. During the storm, water covered many of the barrier islands. 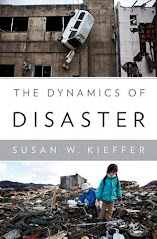 As bulldozers and bucket loaders tried to clear the streets from sand brought inland, they were piling up like snow after a winter snowstorm, in some places there were piles up to 20' high. Beaches change all the time in response to the seasons and to individual storms. Change is the norm. During storms, waves attack parts of the beach system, moving sand from high-energy sites to lower energy environments. This process can take sand toward the shore, by the process known as "overwash" that appeared in the reports about Hurricane Sandy, or can take sand away from the shore, transporting it offshore and out, sometimes into sand bars. This process tends to cause storm waves to break further offshore and decreases the wave action that actually reaches the beach. As sea level rises in the future, beachs will migrate landward, somewhat like a tractor tread rolling over itself. The transport of sand into New York City or Seaside Heights (photo above) is an example of the transport of sand inward, and a portent of things to come if the number or intensity of hurricanes increase due to global warming. Prior to human intervention, cycles of storms would work on beaches, repeating this process over and over on many scales, resulting in the beaches that we had in the early part of the 20th century. As we humans have constructed infrastructure, often far from the beaches, the supply of sand to the coasts has been greatly altered, often reduced. Thus, the normal beach building processes have, for many decades, been altered by humans. Beaches are now, at great expense, often only replenished as sand is carted from one place to another in an ongoing intervention with where "Mother Nature" wants to put it. Fittingly, the first beach replenishment project in the U.S. was at Coney Island in 1922-1923. Here's a link to a before and after image of the Mantoloking Bridge and damage near it where the hurricane cut a new connection across the barrier island connecting the Atlantic Ocean and the Jones Tide Pond. This bridge, built in 2005, cost nearly $24 million, with an additional $5 million for design and purchase of rights-of-way. It has been labelled as "unstable" now.